Cheetah vs car: Which one is faster? With an acceleration of 0-100kph (62 mph) in three seconds the African predator is about as quick off the line as the Techeetah team's racing car and their French driver Jean-Eric Vergne - winner of July's Montreal E-Prix - agreed to take on an apparently tame four-footed opponent in a drag race. The cheetah is renowned for being the world's fastest mammal but is also one of its most endangered species. Recently the organisers of the environmentally-friendly Formula E racing series set up a race between one of their cars and a tame cheetah to highlight the impact of climate change on the African predator. 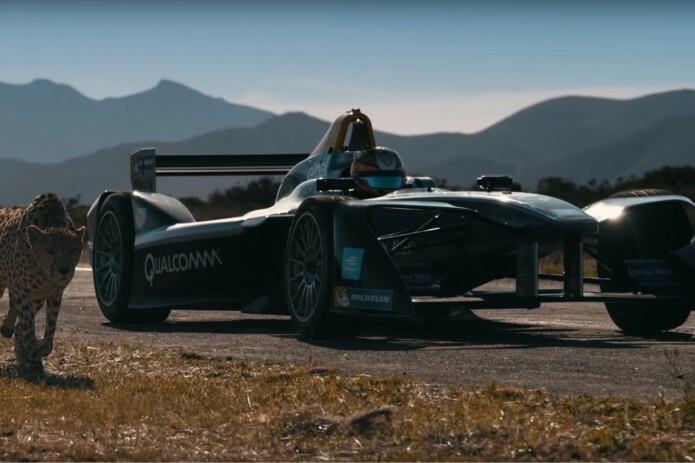 Video provided by Formula E shows the cheetah taking a lead off the line but eventually losing narrowly to the car, which has a top speed of 225kph (139 mph) compared to the animal's maximum of about 112kpm (70mph). According to the World Wildlife Fund the cheetah is endangered due to a loss of habitat, reduced prey and direct persecution. It is listed as 'vulnerable' in the International Union for Conservation of Nature's Red List of threatened species, which says only about 6,700 remain in the wild. A graphic at the end of the short film, which was shot on a landing strip in a remote part of South Africa's Western Cape, assures viewers no animals were abused or mistreated in the production.